Abstract. Black carbon aerosol (BC) deposited to the Arctic sea ice or present in the free troposphere can significantly affect the Earth's radiation budget at high latitudes yet the BC burden in these regions and the regional source contributions are poorly constrained. Aircraft measurements of aerosol composition in the European Arctic were conducted during the Aerosol–Cloud Coupling And Climate Interactions in the Arctic (ACCACIA) campaign in March 2013. 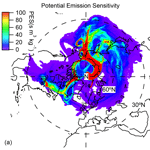 Pollutant plumes were encountered throughout the lower to upper Arctic troposphere featuring enhancements in CO and aerosol mass loadings, which were chemically speciated into BC and non-refractory sulphate and organic matter. FLEXPART-WRF simulations have been performed to evaluate the likely contribution to the pollutants from regional ground sources. By combining up-to-date anthropogenic and open fire biomass burning (OBB) inventories, we have been able to compare the contributions made to the observed pollution layers from the sources of eastern/northern Asia (AS), Europe (EU) and North America (NA). Over 90 % of the contribution to the BC was shown to arise from non-OBB anthropogenic sources. AS sources were found to be the major contributor to the BC burden, increasing background BC loadings by a factor of 3–5 to 100.8 ± 48.4 ng sm−3 (in standard air m3 at 273.15 K and 1013.25 mbar) and 55.8 ± 22.4 ng sm−3 in the middle and upper troposphere respectively. AS plumes close to the tropopause (about 7.5–8 km) were also observed, with BC concentrations ranging from 55 to 73 ng sm−3, which will potentially have a significant radiative impact. EU sources influenced the middle troposphere with a BC mean concentration of 70.8 ± 39.1 ng sm−3 but made a minor contribution to the upper troposphere due to the relatively high latitude of the source region. The contribution of NA was shown to be much lower at all altitudes with BC mean concentration of 20 ng sm−3. The BC transported to the Arctic is mixed with a non-BC volume fraction representing between 90–95 % of the mass, and has a relatively uniform core size distribution with mass median diameter 190–210 nm and geometric standard deviation σg = 1.55–1.65 and this varied little across all source regions. It is estimated that 60–95 % of BC is scavenged between emission and receptor based on BC / ΔCO comparisons between source inventories and measurement. We show that during the springtime of 2013, the anthropogenic pollution particularly from sources in Asia, contributed significantly to BC across the European Arctic free troposphere. In contrast to previous studies, the contribution from open wildfires was minimal. Given that Asian pollution is likely to continue to rise over the coming years, it is likely that the radiative forcing in the Arctic will also continue to increase. How to cite: Liu, D., Quennehen, B., Darbyshire, E., Allan, J. D., Williams, P. I., Taylor, J. W., Bauguitte, S. J.-B., Flynn, M. J., Lowe, D., Gallagher, M. W., Bower, K. N., Choularton, T. W., and Coe, H.: The importance of Asia as a source of black carbon to the European Arctic during springtime 2013, Atmos. Chem. Phys., 15, 11537-11555, https://doi.org/10.5194/acp-15-11537-2015, 2015. We show that during the springtime of 2013, the anthropogenic pollution particularly from sources in Asia, contributed significantly to black carbon across the European Arctic free troposphere. In contrast to previous studies, the contribution from open wildfires was minimal. Given that Asian pollution is likely to continue to rise over the coming years, it is likely that the radiative forcing in the Arctic will also continue to increase.